Bible Contradiction? Did Sarah have faith that she would conceive? 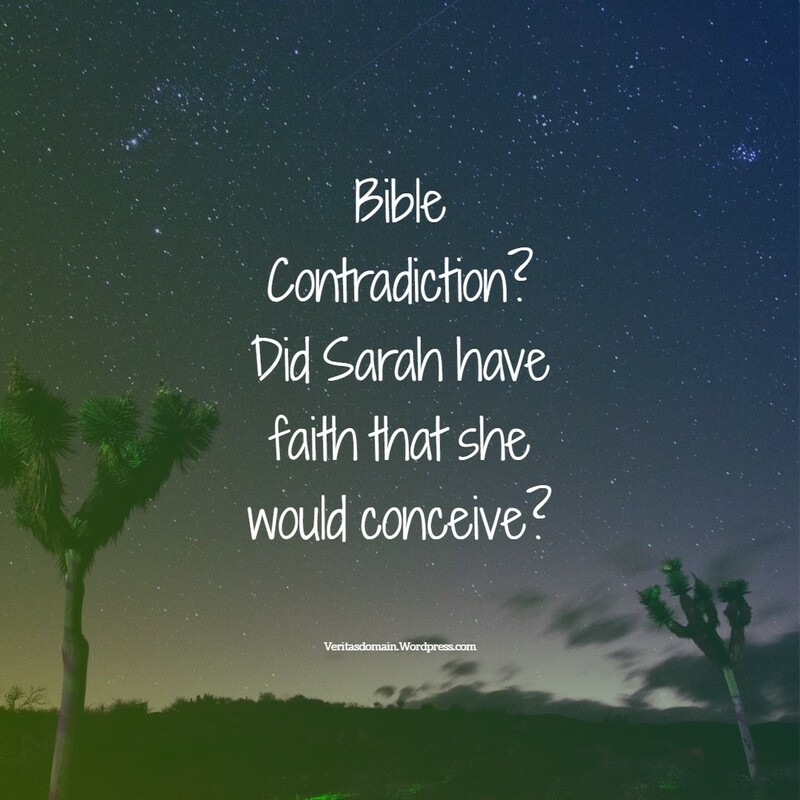 For today’s post we will tackle the question the Skeptic Annotated Bible asked: Did Sarah have faith that she would conceive? No, she laughed at God. When dealing with skeptics’ claim of Bible contradictions it seems one can never be reminded enough of what exactly is a contradiction. A contradiction occurs when two or more claims conflict with one another so that they cannot simultaneously be true in the same sense and at the same time. To put it another way, a Bible contradiction exists when there are claims within the Bible that are mutually exclusive in the same sense and at the same time. Having seen that in order to contradict Hebrews 11:11 we need a verse that assert “Sarah never had faith she would conceived” we note that Genesis 18:10-15 does not contradict Hebrews 11:11. Genesis 18:10-15 does not teach Sarah never had an instance in which she had faith she would conceived. “Never” is not mentioned in Genesis 18:10-15. Likewise having seen that in order to contradict Genesis 18:10-15 we need a verse that assert “Sarah always had faith she would conceive” we note that Hebrews 11:11 does not contradict Genesis 18:10-15. Hebrews 11:11 does not teach Sarah always in every instance had faith she would conceive. “Always” is not mentioned in Hebrews 11:11. Another way of seeing how there is not a contradiction between Hebrews 11:11 and Genesis 18:10-15 is to note more carefully what’s going on in both passages. Genesis 18:10-15 is a narrative of a specific incident. Contextually Abraham and Sarah was in a tent by the oaks of Mamre (Genesis 18:1) in which the Lord and two angels visited them. This was before God’s destruction of Sodom. Genesis 18:10-15 does record a moment in time in which Sarah did doubt the Lord’s promise that one day she would have a child in her womb by laughing at the Lord. However that doesn’t mean that in other moments in Sarah’s life she didn’t have faith in God that she will be able to conceive. Also if Scripture talk about other moments when Sarah had faith that God would help her to conceive that doesn’t mean it is in contradiction to Genesis 18:10-15. Again revisit the definition of what is a contradiction. Different moments of time are in view and therefore it is not a contradiction when one moment Sarah had faith while another moment Sarah did not have faith. Hebrews 11:11 is part of a chapter in the Book of Hebrews that often is called “Hall of Faith.” The author of Hebrews here is giving many examples of various Old Testament characters having faith in God. In Hebrews 11:11 Sarah is mentioned as having faith in God that He can allow her to conceive. Hebrews 11 again is “God’s eye view” into individuals’ heart and faith. Thus Hebrews 11:11 is telling us in the big picture Sarah eventually did have faith in God. This faith Sarah have could have easily been after Genesis 18:10-15. After the incident in Sodom that could reinforce the point that God is powerful for Sarah and therefore she trusted in God. No matter when Hebrews 11:11 took place in which Sarah finally had faith in God that she will conceived we must also remember that Genesis 18:10-15 can record a weak moment in Sarah’s life in which she doubt God’s promise. But rather than undermine the Bible as a contradiction this shows that Genesis 18:10-15 record of Sarah’s struggle to believe is an indication that she’s a sinful finite human being just like all Christians who have faith and yet at times doubt and struggle to believe. Like many Christians there are up and down period of faith in the Christian life. Sarah was no different. Hebrews 11 mention other Old Testament believers that did have moments of struggle with their faith. In that light Sarah is no different. Hebrews 11 is not meant to be a hall of perfection. Thus Hebrews 11:11 about Sarah shouldn’t be understood as contradictory to the account in Genesis. There is no Bible contradiction here. The Skeptic Annotated Bible’s attempt to conceive this as a Bible contradiction is surely laughable. Thanks for examining another alleged contradiction. Hebrews 11 has an interesting collection of “characters.” All of them had struggles with their faith. I’m grateful God also shows the failings of these OT saints so we can relate. That’s a good point to add, that Hebrews 11 mention Old Testament believers that did struggle with their faith. In that light Sarah is no different; thus, Hebrews 11 is not meant to be a hall of perfection. Thus Hebrews 11:11 about Sarah in the contextual flow of Hebrews 11 shouldn’t be understood as contradictory to the account in Genesis. You made such a good point that I’m adding this point and modifying my post because of it, thanks for that Tom! Thanks, Jimmy! I’m so glad the Lord showed us in His Word how the “heroes of the faith” were also sinners who needed the Savior. You’re welcome! Also I wanted to ask if my comment on your book review about civil religion might have ended up in your spam box…for some reason I thought I wrote something but can’t seem to find it! Yup, it was in the spam folder. Sorry about that, Comment posted! Really interesting! Thank you for this, SLIMJIM! Thanks Josh, thank you for reading all the way in Japan! By the way can you check your spam box to see if my comments are blocked on your blog? I did find your comments in the spam box, for some reason, so I approved them, of course. 🙂 Don’t know why WordPress did that… Thanks for telling me and thank you so much for your comments! They really made my day! Witty ending! That was hilarious! Well I’m glad someone read to the very end and got it! Thanks for reading all the way to the end! God’s Word in its context can defend itself from the attack of skeptics, amen?